I had never visited Rameswaram as far back as my memory goes and was not sure what to expect out of the Pamban bridge. My sons have special interest in digging up maps of all places and when I showed them where Rameswaram was they were more than eager to get there to see the historic Pamban bridge. There were few options for me to get there: Rail, bus, car or part flight-then car. We booked a train from Bangalore to Madurai and then an Innova for the rest of our journey. We stayed at Astoria business hotel in Madurai on which I have a separate post if you would like to read. 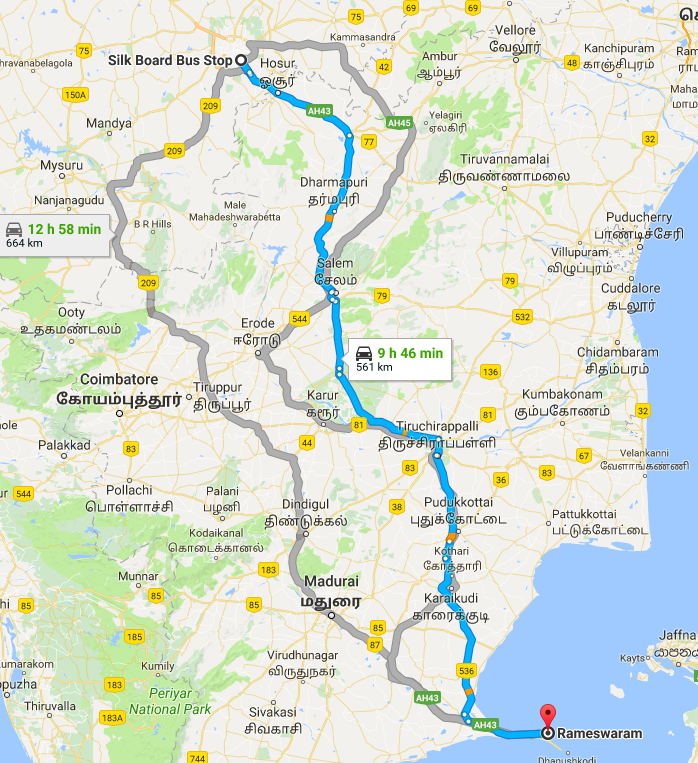 The shortest distance is about 560km via Salem-Trichy-Pudukottai-Karaikkudi and would take nearly 10 to 11 hours of driving with stops in between. Since this was too much of drive, and I wanted to spend the night traveling the best option was train. I took a train from Bangalore to Madurai. Two common trains are the Tuticorin Express and Nagercoil Express. If you want to know the exact list of trains, click here. I reached Madurai at about 7:00 AM. Please be advised these trains can be late sometimes and if you have tickets in coaches S10 and beyond you can expect lots of people from unreserved compartments to be flooding these bogies as well. If you want to read my experience on that read my blog post here. Once you are in Madurai - major places such as Kanyakumari, Rameswaram and Kodaikanal are all nearby - about 3 hours by drive. We took up an Innova on hire from Madurai to Rameswaram which costed us between 10-12 Rupees per kilometre. There is a fixed cost and and a variable cost split in this arrangement. Be aware that if you are going to the hills, then a separate hill stay charge of upto Rs.600/- is levied. This could be 100 or 200 higher depending on the market fluctuations. Travel from Madurai to Rameswaram takes a good 3 hours by the time you reach you should be hungry for sure. 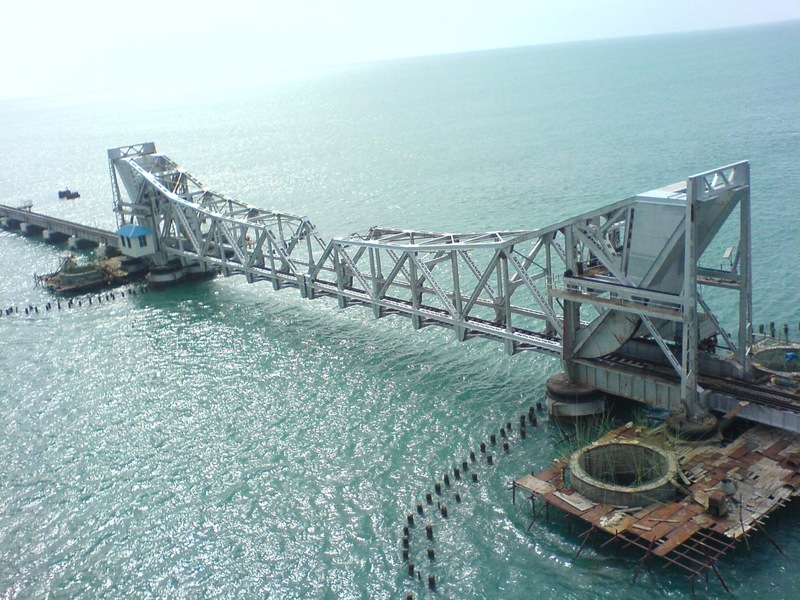 As you go along the route, you will first enter Rameswaram via the Pamban bridge. Most vehicles make an undesignated stop here owing to the popularity of the bridge. We went in the month of April which was presumed to be hotter but was not really so. Humid yes, but hot no. So you could go to Rameswaram within April end but no later. Best time to visit Rameswaram is between August to February when temperatures would likely be bearable. Its not so much the heat but the humidity which will kill you. Pamban is an island that has the town of Rameswaram and it is linked to the mainland via the Pamban Bridge. It is the second largest sea bridge after Bandra-Worli Sea Link. The bridge is nearly 2km long and was rebuilt after the initial construction in 1914. Due to a cyclone that damaged the bridge in 1964, the Government had to repair it after. In 2013 the bridge got a damage due to a naval barge again. At a cost of 25 crores, the existing 65.23 metres (214.0 ft) long rolling type span was replaced with a 66 metres (217 ft) long single truss span which could be opened automatically. The beauty of this bridge is that it even takes the weight of goods trains which are more heavier than passenger trains. At the same time when ships need to go through it can be opened up to allow them to pass. The sea with its myriad shades of blue, indigo and purple is a sight to behold at Pamban. The enormity and beauty of Pamban Railway cannot be stated and has to be seen with one’s own eyes. 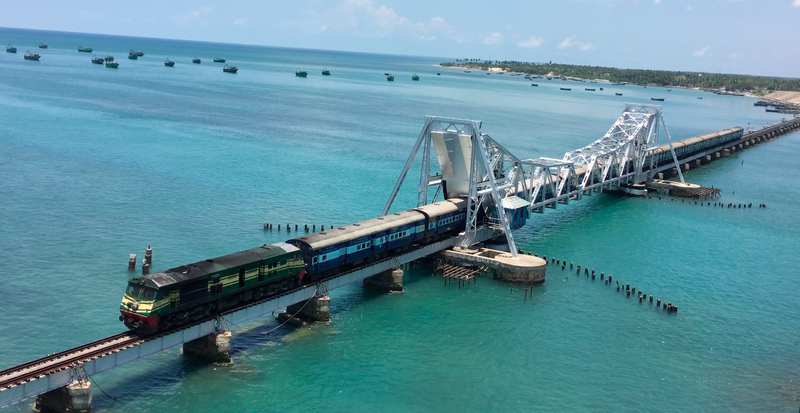 This is a 4K video of a train passing through the Pamban Bridge which i hope you will enjoy. If you have a 40-55 inches TV, this would be worth a watch on that size of a TV, its almost as good as being there in real. Remember to set the resolution to 4K on YouTube. What do you think of the Pamban Bridge experience? Write to me in the comments section.